McDonald’s is well-known for localization of its menu. As a result, almost every country in the world has at least one different item on its menu. Mighty Angus is a burger consisting of an Angus beef patty with cured bacon, red onion, cheese, onion relish, mayonnaise and served on a sourdough bun. Also available are Grand Angus, Bacon BBQ Cheeseburger and Bacon Chicken Deluxe. The “Croque McDo” consists of 2 melted slices of Emmental cheese and a slice of ham toasted between 2 hamburger bun (also available in France). A sandwich with beef burger, cheddar cheese and grilled onions flavored with soy sauce. McLobster is a lobster roll, is available seasonally at select locations in Atlantic Canada. El Maco is a burger with barbecue sauce (also available in Sweden). Shogun Burger consists of teriyaki pork patty with lettuce, served in a sesame seed bun. Chicken Maharaja Mac has two grilled chicken patties with a smoke-flavoured mayonnaise, fresh onions, tomatoes, processed cheddar cheese in a toasted sesame seeded bun. Also available — Lamb version. A vegetable burger with potato, peas, and spices, tomato, onion, and a vegetable-tomato mayonnaise. Kebab served on flatbread (also available in Argentina). Ebi Filet-o is a shrimp burger with special sauce and lettuce. It is endorsed by Ebi-chan, more known as Yuri Ebihara, a popular Japanese celebrity. Prosperity Burger consists of beef patty with black pepper sauce. Only available during Chinese New Year. Also available — Chicken Prosperity Burger. McArabia consists of two grilled chicken patties (de-boned breast meat), Arabic bread, lettuce, tomatoes, onions, garlic sauce (also available in Egypt, Morocco and Pakistan). McLaks is a salmon burger. McSpaghetti consists of spaghetti noodles served in sweet tomato-based sauce, hot dogs and grated pasteurized cheese. McRice Burger has ground beef burger, or chicken fillet served with special sauce in fried rice cakes (also available in Thailand, Singapore and Indonesia). Bulgogi Burger consists of pork patty in bulgogi marinade. Samurai Pork Burger has pork patty flavored with teriyaki sauce. Have I missed out the McDonald’s in your country? Let me know and I’ll add it to the list. They really need to bring the McAloo Tikki to the USA. A great veggie alternative. In some Mcdonalds in Canada we have Poutine. (French fries with cheese curd topped with gravy). It’s a Canadian favorite, it was brought in as a limited time only but there is still a couple Mcdonalds that still serve it. The McOz in Australia is no longer available It was removed. The McDonald’s burger specially for Australia is the Mighty Angus Burger and the Grand Angus Burger. Now there is also another burger that is available in Australia called the McFeast, now although there has been other burgers around the world called this it is in fact a different burger, it is structured much like a whopper found at Hungry Jacks (Burger King). Now on a side note there is a McMuffin, it was called the Massive McMuffin, it was a promotional item that was removed many years ago but returned for a short time about a year ago and can still be requested at some Mcdonalds stores around Australia. 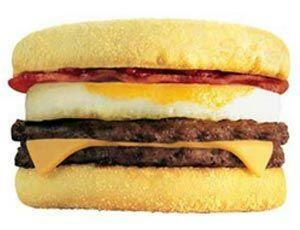 It is a sausage and egg McMuffin with an extra patty a rash of bacon and tomato sauce. @Josh: Thank you for the update. I will update the list. OOOMMGGGG look at the Norway’s McLak ! Salmon burger, I am definitely going to make some this weekend. That burger will be the first burger I would love to try if I ever get the chance to vist Norway. In Hawaii, we have saimin and we have breakfast meals that have rice, portuguese sausage and Spam. it is always interesting to see what differences between restaurants in foreign countries. But I do believe that McDonalds probably has more stores than any other company out there.